Eastrea has striven for over 60 years to have its own village hall. The Eastrea Village Hall Foundation was formally made a Registered Charity in 1994 and has since sought for a site on which to construct the hall, now known as The Eastrea Centre. Older villagers may remember that the site of The Windmill, the former public house on the A605, was once agreed for the site of a village hall. There were hopes that the hall might be developed on the large field at the end of Thornham Way, but this was designated public open space. 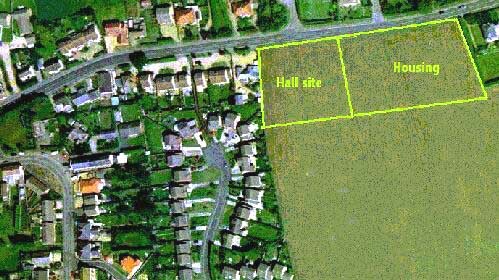 Fenland District Council then nominated the site (below) for the hall, the land being freed for the project in return for development of an adjacent site for 'executive housing'. With this site our target, the Foundation commissioned Jonathan Ellis Miller, the Cambridgeshire architect, to draw up plans for a futuristic building that would harmonise with the rural environment. Quantity Surveyors Henry Riley of Peterborough were appointed to adivse on our costs, and we have had voluntary input on matters like finance from a dedicated team of enthusiasts. The building that the project team have designed is illustrated below. This is the Eastrea Centre. It is designed to be highly efficient in terms of energy conservation and sound insulation, and will provide much-needed facilities for Eastrea - and indeed for much of the area administered by Fenland District Council. Below is the site chosen for the construction of the Eastrea Centre. The land lies to the east of Eastrea, south of Coates Road (the A 605). The site is roughly square, and covers roughly an acre. An adjoining site has been agreed for the construction of executive houses, as a condition of land being provided for the Centre. The permissions are now before Fenland District Council, and are awiting a decision -- probably in November. JD Developments took over the handling of the site. Negotiations in 2008 confirmed that they could offer £250,000 (subject to being given permission to build 14 homes on the adjacent land) and at the Annual General Meeting a committee of eight elected Trustees set about finalising the plans. Meanwhile our submission for a grant of £500,000 to the Big Lottery Fund was successful in getting through to the final shortlist, and an application has also been prepared for WREN (the landfill tax people). Other sites had meanwhile been considered. A second site was on open land accessed through the farm gateway opposite the southern opening off Mayfield Road onto Wype Road. It is owned by Cancer Research UK. Discussions between their lawyers and the local authority reached an impasse over the lack of a suitable pavement through the village along Wype Road. The third site is south of the village, on the western side of Wype Road. This open meadow owned by Mr Brian Aldridge was duly considered, but unfortunately it proved to be too far outside the village to ne covered by the Development Area boundary (the DAB). The village is still home to some of the earliest members, who joined in the 1940s. Events still have to be held in private homes, in the village public house (the Nag's Head, which is currently closed) or on the village green. The funds collected by villagers currently up to £40,000 and are held in a savings account so that they can only be used for development work on the hall. The funds are gathering interest for the future, and cannot meanwhile be used for any other purpose. Fenland District Council intimated to the Foundation that they would allocate £50,000 towards the project. However, the withdrawal of the land means that this money was lost. The landfill tax organisation WREN agreed a grant of £40,000 towards the cost of the building work. This too was withdrawn because of the delay caused by the loss of the land. Approaches have been madeto the major funding agencies. Our application for £500,000 from the Big Lottery Fund has been got through to the final shortlist, and we have been promised up to £250,000 by the developers - with project management services that they will provide in addition. We are now confident that a village hall is, at last, within sight. One early site was the grounds of the former old Windmill public house on the main March Road. Planning permission was granted in the 1960s, but no work started before the permissions expired. Since that time, the site was recognised as being unsuitable for modern requirements: access and parking were restricted, and the nearest we came to having a hall on that site was when a Portakabin stood there for many years during the 1990s. Small as it was, the building was used for the youngsters to play pool, for general and local elections, and for small meetings. The land was eventually sold for residential development, all the money being added to the savings fund. During the 1990s a site was offered to the south-west of the village at Thornham Way, but permissions were not finalised and that site is now destined to remain as public open space. Discussions continued behind the scenes (in Cambridgeshire and London) and in March 2001 Fenland District Council finally agreed to allocate a 1-acre (0.4 hectare) site on Coates Road - see photo above. The press and the BBC have supported the scheme throughout - for example, the Peterborough Evening Telegraph reported in March 2001 that our village had at last obtained a site after a fifty-year wait. At the last minute, with the building designed and everything ready to roll, plans had to beon hold. In December 2007 the Village Hall Foundation was told they had been shortlisted for a grant of £500,000 from the Big Lottery Fund, followed in April 2008 by an offer of up to £250,000 from the new developers of the Garner land, JD Developments. New base for those who wish to get back to work. Sports centre (we have been approached by local teams about this). In June 2008 the first major document for this development strategy was prepared. Entitled The Eastrea Plan, it sets out a series of proposals, including a village sign for the green, a new bus-stop for Eastrea, and an outline of how traditionally-designed homes could provide affordable housing for young Eastrea families. These homes would be set alongside the Eastrea Centre providing a community centre that would help Fenland realise their latest Core Strategy for the future. A second document was the Business Plan and Report for the Eastrea Centre itself. This document contains more than 11,000 words and 100 pictures, and fully details the site, the project costs, the new committee and our plan of action. The first copy was sent (as you'd expect) to the Mayor of Whittlesey, and others have since been discussed with local our MP and his successor. The Eastrea Centre is back in action, and future developments will be posted here! E-mail may be sent to: mail@eastrea.net - eventually the village would be able to operate its domain from a computer system in the village hall. See also the village site, read press reports, or see Eastrea in the old days.